Rogue Marine utilizes marine industry standards to ensure every installation is top quality, reliable, looks professional, and is easy to service and upgrade. We use the best quality marine grade components to give you years of reliable service. At the completion of every installation, documentation is provided including User Manuals, Quickstart Guides, a Network Diagram, and details on how the system was configured. Collaborative installions where the owner is part of the installation team. This can help to reduce installation cost and give the owner a significant understanding of how the systems are installed and configured. 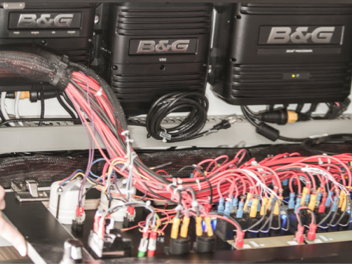 Rogue Marine is on call to help with specific parts of the installation that the owner is not comfortable performing such as instrument calibration or configuring wireless networks. Copyright 2019 © ROGUE MARINE. All Rights Reserved.